Jamie here!! Looking to change up your dessert routine? You’re going to love the cool, creamy sweetness of lemon filling mixed with the crumbly, salty crust in these best-of-both worlds Lemon Bars with Saltine Crackers. This is the PERFECT treat for Spring – an unexpected punch of flavor and all KINDS of texture! But first, a quick word about treats… My husband is one of the weird ones who doesn’t care for dessert. He never wants a cake on his birthday or (gasp!) ice cream on a hot summer night. 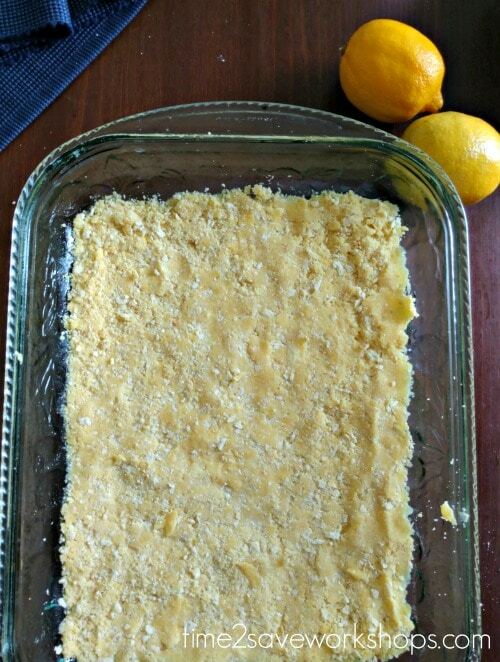 So it wasn’t until the 3rd year of our marriage that I stumbled upon a treat that he actually asked me to make again – and it was these Lemon Bars. Now I usually trade off between these and my easy Derby Pie recipe for his birthday dessert – and it’s always such a nice change to have these refreshing bars again! Before you begin, get the butter nice and soft. I like to set it on the stove while the oven is preheating, turning it to the other side every minute or so. 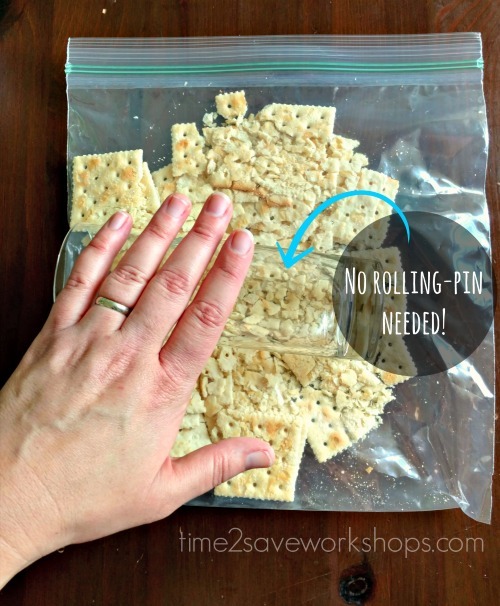 Crush the sleeve of saltines in a large ziploc bag with either a rolling pin or by rolling a glass over them. Make the crumbs as small as possible! In a large bowl, mix the lemon cake mix, 1 egg and softened butter together with an electric beater. Stir in the saltine crumbs. You may need to cut some of the dry ingredients into the butter with a fork. Work it together until you have coarse crumbs. Measure out two cups of crumb mixture and set aside for later, press the rest of the mixture into a pre-greased 13 x 9″ pan. Bake at 350 for 20 minutes, or until edges of crust are golden brown. Pour the filling onto the crust and spread evenly. Top with the remaining crumb mixture and bake for another 20-25 minutes, or until edge of topping is golden brown. Cut into squares and refrigerate. Makes 1 dozen large bars, or 2 dozen small ones. *These are RICH, so you might want to go for the small squares! 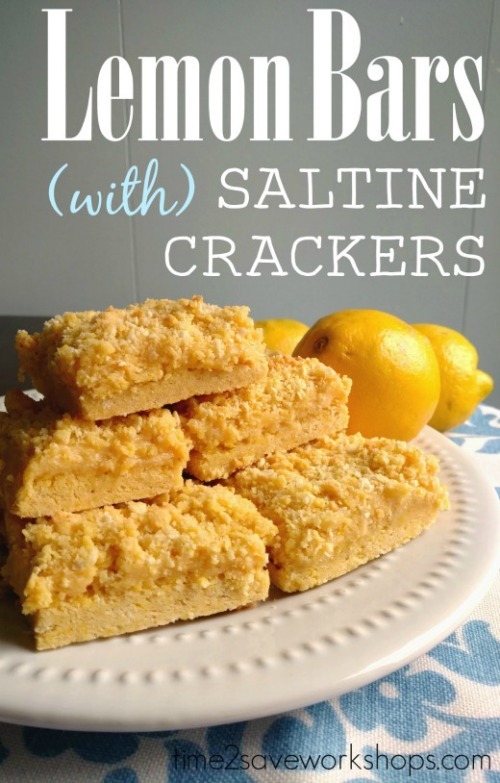 Try using vanilla wafers or graham crackers instead of saltines. Don’t have fresh lemons? Use lemon juice (about 1/2 cup) or even LIME juice would be yummy, I bet! 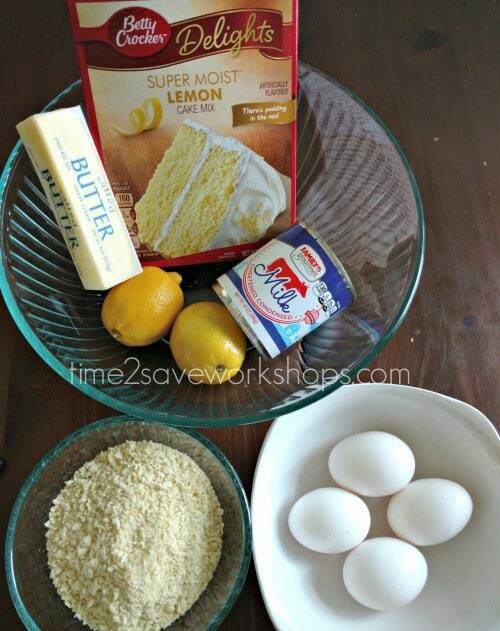 In a large bowl, mix the lemon cake mix, 1 egg and softened butter together with an electric beater. Stir in the saltine crumbs. You may need to cut some of the dry ingredients into the butter with a fork. Work it together until you have coarse crumbs. Measure out two cups of crumb mixture and set aside for later, press the rest of the mixture into a pre-greased 13 x 9" pan. This sounds like a wonderful recipe, thank you for sharing! what is the nutritional information? this isn’t keto, right?